Borders is promoting the re-design of its online store with two great coupons that can be combined for major savings. Get free shipping on almost everything at Borders.com, with minimal exclusions, plus get 33% off the list price of many items. Both coupons expire today Nov. 15, 2010 at 11:59 p.m. PST. The 33% off coupon works in stores, too. The free shipping discount will apply automatically, no coupon code needed. To get 33% off, use coupon code BMH4838T online or print the coupon through the above link if you shop in stores. 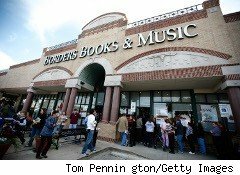 Join Borders' free loyalty program to use these coupons. One per person. The 33% off coupon is also valid at Borders Express and Waldenbooks. Caveats: the 33% off coupon cannot be combined with any other offer, promotion, sale pricing, coupon or discount, including group discounts, with some exceptions. Excludes Borders Rewards Plus memberships, previous purchases, special orders, shipping, gift cards, coupon books, newspapers, magazines, comics, audiobook downloads, music downloads, vinyl LPs, Rosetta Stone® software, tax software, video games, all electronics, including e-Readers, e-Reader Protection Plan Packs, certain e-Books, used books, and textbook rentals. At Borders.com only, offer also excludes posters and scrapbooking and arts and crafts items.